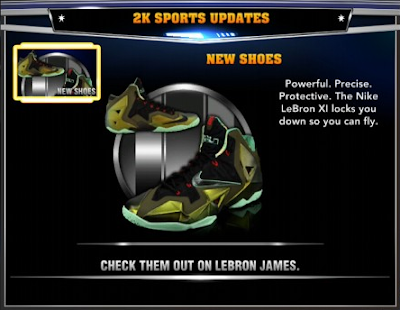 2K Sports has been releasing updates throughout November to provide an accurate roster and add new items within NBA 2K14. Today's update brings the LeBron 11 (XI) in the game, which can be found under 2K Shoes > Nike category. Player ratings, injuries, and lineups have been updated to reflect the NBA season that is currently going on. Full details below. Update: The Timberwolves-Kings trade (Derrick Williams for Luc Mbah a Moute) is not reflected. 2K Sports uploaded three 11/26 rosters on 2K Share. In order to get the full update, you need to get the most recent version. This is now available to download on both the Xbox 360 and PS3. For PC users who have non-activated copy, you can download the manual update patch here - 11/26/13 Links - Mega | Mediafire | Box | 4shared.